These look absolutely gorgeous! Saw this recipe yesterday and though I haven’t made it myself yet, it looks too yummy to not share immediately. I read some of the reviews and one reader posted that in the absence of parchment and non-stick spray, cooking on stoneware works too. With many of you home from work today due to President’s Day, and with a coating of snow on the ground, I can think nothing better than to serve these with either soup (Tortilla and Tomato Soups spring to mind) or salad; if you’ve got a recipe for a favorite, healthy soup you’d like to share, please send it along. Serve with salad or crumble into soup. For variety, swap basil for chives and add fresh minced garlic. Or try crushed fennel seeds and red pepper flakes instead. Preheat oven to 425ºF. Line two cookie sheets with parchment paper (or coat with cooking spray). Place scant tablespoons of cheese on prepared pans, about 1 1/2- to 2-inches apart. Flatten out each pile of cheese into an oval shape; sprinkle with herbs and pepper. 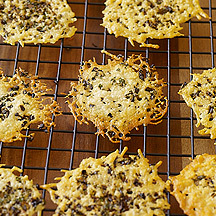 Bake until cheese crisps turn golden and resemble lace cookies, about 5 to 6 minutes. Cool on pan until set and then remove to wire rack to cook completely. Yields 2 cheese crisps per serving. Using a high-quality Parmesan cheese has a very big impact on the flavor of this recipe. © 2011 Weight Watchers International, Inc. © 2011 WeightWatchers.com, Inc. All rights reserved. WEIGHT WATCHERS and PointsPlus™ are the registered trademarks of Weight Watchers International, Inc. and are used under license by WeightWatchers.com, Inc.
Next Post Tile? Check. Wine? Check Please!